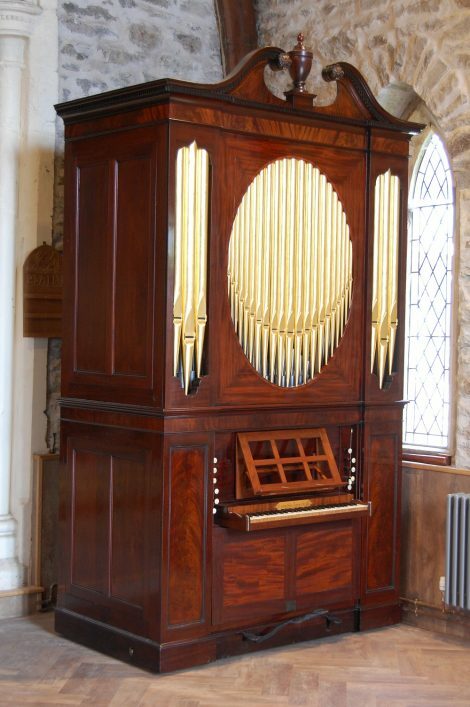 The organ was made as a chamber organ by William Allen, of 11 Sutton Street Soho London in about 1800, towards the beginning of Allen’s career. It was moved into the church in 1920, which may be when a pedalboard was added, and new stops (Gamba for Swell Hautboy, new Flute for Bassoon, loss of Sesquialtera-Cornet). The organ was restored by Percy Daniel of Clevedon in 1974, when some mechanical parts were replaced and their surface finish altered. The gilded dummy front pipes had been painted silver, etc. The organ was restored in 2015-16 by Edward Bennett, Guillaume Zellner, Joseph Marsden (pipes) and Nick Hagen (case). The project was guided by Jonathan Edwardes, director of music at St Peter’s. The opening concert was given by Jennifer Bate on April 30th 2016. The original stoplist has been restored, with new mixture, Bassoon, Hautbois and swell box. The casework has been restored, the dummy pipes gilded, the pediment moved inwards and with a new urn. It was decided to leave the tuning slides and the pitch is now A440Hz as it was before the restoration. The manual key compass is GG AA – f³. The shifting movement reduces to Diapasons, Dulciana and Principal. There is a swell box for the Hautbois.